No matter what industry your company operates in, it’s likely that you produce impressive amounts of data. From sales to personnel to inventory, businesses create information that can be incredibly valuable if it can be interpreted correctly and turned into actionable insights. 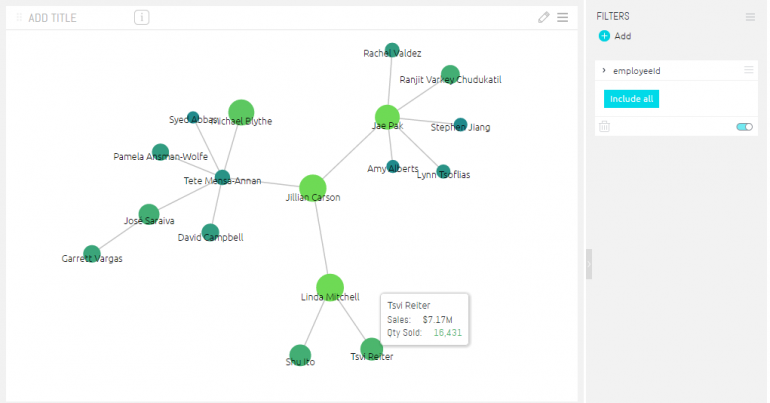 Business intelligence and analytics are centered around this idea, and now more than ever, you can find excellent ways to view and connect data points in creative ways. Taking your visualizations to the next level can really let your data shine. This is where D3 becomes a valuable tool to visualize your datasets in a more dynamic format. Why Should You Use D3? When it comes to online analytics, D3 data visualization tools offers you several advantages over other established languages and programming paradigms. While some include more developed libraries or visual tools, D3 stands out due to its adaptability, ease of use, and how easily it can be integrated with almost any web-based presentation format. Languages such as Flare and Prefuse offer some helpful tools but require plugins to be usable on most modern browsers. Others are simply not as flexible or adjustable. One of the biggest reasons D3 has quickly become a mainstay may sound counterintuitive at first. D3 is not a graphics library or a data processing utility. Instead, it could be considered a bridge between the two. At its core, the D3 visualization tool delivers a simple way to interpret and manipulate data with a low-level, non-monolithic framework. You can easily handle large datasets and create fluid animations and visual styles with little resource allocation, and use stack tools such as SVG and CSS externally to modify the visual aspects. For tasks such as data visualization and interpretation, D3 can open a wider array of possibilities, letting you create highly specific displays of data. You should keep in mind that D3 is not a fix-all tool for your visualization needs. Instead of using it for everything and diluting its effectiveness, it is most advantageous to employ D3 when looking for unique ways to visualize data, or present information in creative ways that offer different interpretations. A great side bonus of D3 is that while it does not have any visual assets, it’s open source, and the surrounding community has created some amazing visual templates. If you can’t think of an original way to exhibit data, someone else may already have, saving you valuable time while giving you a great resource to find data visualization solutions. You can also use D3 when dealing with significantly larger data sets, or when you require specific visual data representations. This type of data mapping is particularly applicable when measuring web traffic, data flow between nodes in a network, or more traditionally, energy flow and consumption. While some analytics suites already include some sort of functionality with this type of diagram, D3 offers the ability to layer different levels, various sources, and highlight individual flows. You can then modify parameters and connect them to your database to interpret live data. D3 graph visualization tools make static diagrams and charts come alive with fluid dynamics that can take advantage of SVG and even Canvas. One highly regarded use case of D3 is a chart used by the New York Times in an article about Facebook’s IPO. While the diagram itself is a simple dot chart, it uses D3 to create smooth transitions and add a dynamic element. Users can hover over specific dots and see specific information, and the diagram opens with a fluid animation that makes it more visually appealing. The Times’ example uses Canvas instead of SVG, which favors rasterized vectors. However, using SVG would offer the same dynamic animation and give even more customizability due to its scalable graphics and its lossless resizing capabilities. While bar charts, pie charts, line diagrams, and dot charts are useful for reviewing data, understanding hierarchical interactions between data can be especially useful when examining information that comes from various related sources. Diagrams such as force-directed networks or tree rings are great representations for visualizing information that comes from nodes within the same branch or understand how different data points connect and interact with one another. Tree ring diagrams communicate different hierarchies and data interactions while force directed networks show connections and interactions between nodes. Using D3 can make them dynamic, letting you highlight individual nodes, examine specific connections, or understand the relationship between data points on different branches by selecting particular lines. Some data involves comparing points to observe multiple outcomes depending on different decisions. Collapsible trees are wonderful ways to visualize outcomes based on how data interacts or how decisions are formulated. Collapsible trees let you understand hierarchies and potential outcomes without having to examine an entire tree at once. With this type of data visualization, D3 delivers the ability to understand hierarchies, but also create potential decision trees based on data, helping develop easily actionable outcomes. More than just charting solutions and diagrams, D3 grants you the ability to create visualizations based on a wide variety of assets. Because it isn’t a graphics library, you can craft any number of possibilities. One popular utilization strategy is to employ D3 map visualization and create interactive charts that can offer specific insights based on location. Maps using D3 can include hovering to display information, zoom to specific regions, and change colors by manipulating parameters. It’s not a silver bullet, but D3 can enhance your existing dashboards, offer novel ways to present data to partners, employees, and clients, and give you a valuable tool for data analysis. By implementing D3 visualization tools where they are most effective, you can boost your business intelligence activities and deliver the data you need in the specific medium that is most effective.